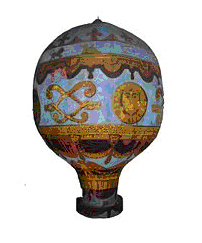 The first clearly recorded instance of a balloon carrying passengers used hot air to generate buoyancy and was built by the brothers Joseph-Michel and Jacques-Etienne Montgolfier in Annonay, France. After experimenting with unmanned balloons and flights with animals, the first tethered balloon flight with humans on board took place on October 19, 1783 with the scientist Jean-François Pilâtre de Rozier, the manufacture manager, Jean-Baptiste Réveillon and Giroud de Villette, at the Folie Titon in Paris. The first free flight with human passengers was on 21 November 1783. King Louis XVI had originally decreed that condemned criminals would be the first pilots, but de Rozier, along with Marquis Francois d'Arlandes, successfully petitioned for the honor. The oldest established ballooning company in Turkey "Kapadokya Balloons™" is owned and operated by Lars-Eric Möre and Kaili Kidner, who both have vast experience in ballooning, specializing in passenger transport. For almost 10 years Lars & Kaili piloted large passenger balloons in France, Austria, Italy and Switzerland. In 1991 Kaili and Lars operated the first commercial passenger balloon in Turkey for a German tour operator. Since then Lars and Kaili's balloon operation in Cappadocia has became the benchmark for quality tourism in Turkey and was adopted by the Turkish Tourist Board. Being the oldest established ballooning company in Turkey, Kapadokya Balloons have flown more passengers in Turkey than all the other balloon companies combined, past and present. Their experience in Cappadocia allows them to choose the best launching locations for the most scenic flights possible for each day's weather conditions. Lars and Kaili, the chief pilots, have almost 45 years of combined ballooning experience. They have personally flown close to 50,000 passengers, while maintaining a perfect safety record. chimneys and soar over the magnificent Cappadocian landscape. A flight with Kapadokya Balloons™ is truly "the experience of a lifetime!" A hot-air balloon flight is unique from all other experiences of flight as there is no sensation of motion. Travelling at heights of up to 1500 feet, the feeling is one of peace and tranquility. The earth slowly descends and rotates below you. Within moments after lifting off you become at ease while you effortlessly drift over the treetops and the spectacular Cappadocian landscape. It is like a dream to gently float over the countryside in complete harmony with your surroundings. 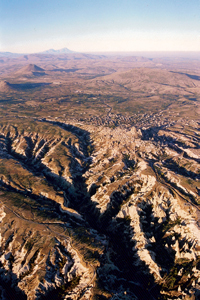 The deep canyons and lush fertile valleys of Cappadocia provide the balloons with an ideal playground for a unique and memorable flight; gentle winds carry over places that could never be reached except by balloon. Ballooning can be such fun! In season one can even pick apricots from the trees! Bird's eye view of magical landscape of Cappadocia.